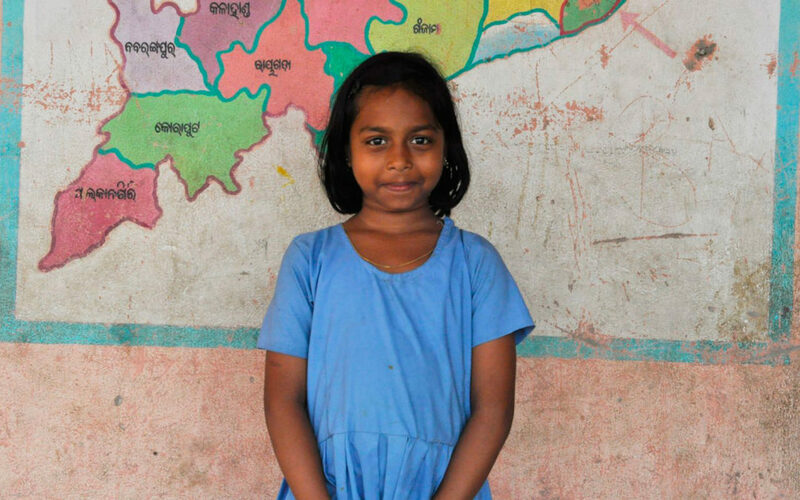 It’s her calm, soft-spoken nature that compels us to talk to her at the Vijayanagar Project Primary School in Puri. She is a nine-year-old girl in fourth standard and her name is Suchismita Nayak. She is the eldest of three siblings, and the second born is studying at the same school in third standard. Suchismita’s father earns and manages the family by selling tea at the beach. Her mother does stitch work to add-on the family income. Due to unfavourable financial condition there is limited means of getting good food at home. This is why the mid-day meal provided by Akshaya Patra at school is a blessing in disguise to such families. At least two of the children from the Nayak family are guaranteed a nutritious meal every day besides acquiring free education. According to Suchismita’s teachers she is a very attentive student. Her favourite subjects are English and Social Science. When we inquire about her ambition, Suchismita says, "I want to be a Police Officer when I grow up and throw all thieves in prison." The sweet and innocent delivery of her dream makes us smile adoringly. She also reveals that she understands about current affairs through Social Science. To lighten the conversation a bit, we ask her if she likes the food. She gives a beaming smile and says, "Oh Yes! I love soybean and matar paneer (Peas and Cottage Cheese)." Hoping she grows up strong and smart to achieve her dream, we leave the school.